CGHS recruitment 2018-19 notification has been released on official website www.cghs.gov.in for the recruitment of 132 vacancies at Central Government Health Scheme. The candidate who is looking for Pharmacist, ECG Technician can apply online application from 28th July 2018 and before 27th August 2018. ECG Technician:12th Class pass with Science Subjects or Diploma in E.C.G. technician course from a recognised institute. 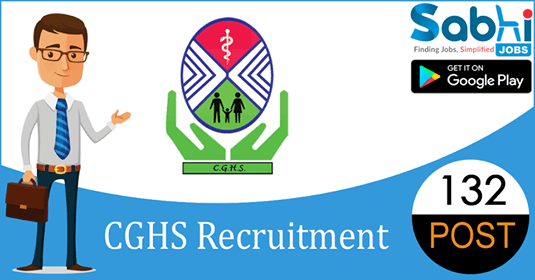 How to Apply Interested and eligible candidates may apply online application form at official website www.cghs.gov.in from 28th July 2018 to 27th August 2018.